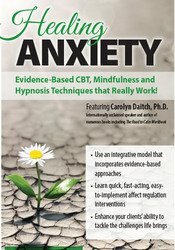 Evidence-Based CBT, Mindfulness and Hypnosis Techniques that Really Work! Using this integrative therapy model, you will learn practical interventions that are applicable to the treatment of panic, generalized anxiety disorder, phobias, social anxiety disorder and post-traumatic stress disorder. A unique feature of this presentation is the four-part protocol developed by Dr. Daitch that integrates mindfulness, behavioral and hypnotic principles. You will leave with a veritable toolbox of techniques that work together to help your clients feel more empowered when flooded with anxiety. If you want to gain skills crafting the best treatment plan for each client’s individual needs, this workshop offers a springboard for your creativity and an invaluable addition to your therapeutic toolkit. Name the four inter-related components of anxiety. Articulate the role of mindfulness in the treatment of anxiety. Demonstrate a treatment protocol using CBT and hypnosis. Communicate two techniques for tolerating uncertainty. Identify two interventions that can help clients tolerate the physiological manifestations of panic. Discuss the sequence of treatment. Carolyn Daitch, Ph.D., is a psychologist, international presenter, and author of Anxious in Love, Anxiety Disorders: The Go-To Guide, the newly released Road to Calm Workbook, and the award winning Affect Regulation Toolbox. Dr. Daitch is the director of the Center for the Treatment of Anxiety Disorders in Farmington Hills, Michigan. She is a certified and approved consultant and elected fellow with the American Society of Clinical Hypnosis and a certified Imago therapist. Dr. Daitch is recognized for her practical easy-to-implement interventions. Her time is split between clinical practice, supervision, consultation, and teaching. She routinely gives trainings to practitioners in the United States and abroad. Financial: Carolyn Daitch has an employment relationship with the Center for the Treatment of Anxiety Disorders. She receives a speaking honorarium from PESI, Inc. Non-financial: Carolyn Daitch has no relevant non-financial relationship to disclose. PESI, Inc. is an AOTA Approved Provider of continuing education. Provider #: 3322. This self-study course qualifies for 6.0 self-study contact hours or .6 CEUs in the Category of Domain of OT and Occupational Therapy Process. The assignment of AOTA CEUs does not imply endorsement of specific course content, products, or clinical procedures by AOTA. Course Level: Intermediate. Expires: 5/9/2019. This course contains 6 hours of self-study continuing education. It was not offered for ASHA CEUs. Please retain your certificate of completion. If audited for ASHA Certification Maintenance, you can submit this certificate of completion at that time. For state licensure, teacher certification renewal, or other credential renewal, contact those agencies for information about your reporting responsibilities and requirements.